Private First Class Bradley Manning was sentenced to 35 years in prison on Aug. 21 for leaking more than 700,000 classified government files to WikiLeaks, an anti-secrecy organization that arranged their publication. Manning, a 25-year old former army intelligence analyst, performed a brave and important service three years ago by exposing the documents to public view, especially those that reveal U.S. war crimes in Iraq and Afghanistan. The fact that a military court found her not guilty of the most serious charge was itself amazing. But at sentencing, she still faced the possibility of 90 years under the Espionage Act charges. So the sentence of 35 years, although the harshest ever imposed for “leaking,” seems to reflect an awareness of considerable public approval and sympathy for Manning’s crimes. Manning had already served three years in military prison before trial, 10 months of it in solitary confinement under extremely harsh conditions that are illegal even under military law. A wide-spread public campaign finally got her transferred to another prison. With her sentencing, she may be eligible for parole in seven or eight more years. A campaign to win her clemency or a pardon is underway, but neither seems likely. President Obama has prosecuted far more “leakers” than any previous administration—at the same time as he has allowed the military to let off free or go lightly on service members who committed murder and other atrocities overseas. Among other documents and videos, Manning exposed the killing of unarmed civilians and two Reuters news service journalists by a U.S. Apache helicopter crew in Iraq; documents known as the “Afghan War diary” and the “Iraq War logs”; and a series of embarrassing U.S. diplomatic cables. According to a support network for Manning, the information has illuminated such issues as the true number and cause of civilian casualties in Iraq, a number of human rights abuses by U.S.-funded contractors and foreign militaries, and the role that spying and bribes play in international diplomacy. Manning is one of a recent spate of “whistleblowers,” including Edward Snowden and WikiLeak’s Julian Assange. Snowden was employed by a civilian contractor to the NSA. The government needs many highly skilled people like them to run its information systems, so it is not surprising that some of them become disgusted with the secrets they see—but not many are brave enough to expose them. Manning and other “leakers” have received support from people around the world. 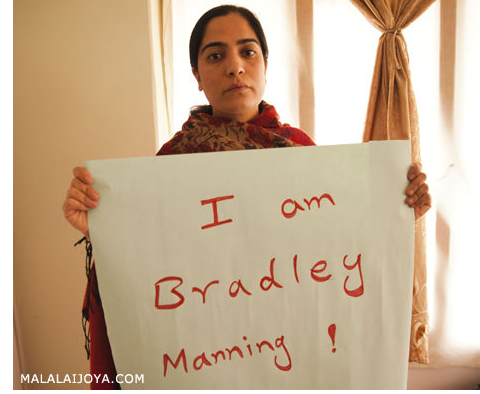 To name one, the Afghan antiwar and women’s rights fighter Malalai Joya joined the “I am Bradley Manning” support campaign. Joya was expelled from the Afghan parliament in 2007 for speaking out against the murderous and misogynist warlords who are part of that government; she was forced to flee the country to escape being murdered. So she is well acquainted with being persecuted for truth-telling, as well as being grateful to Manning for exposing the U.S. army’s wide-spread murder of Afghan civilians. Daniel Ellsberg, who photocopied and distributed to the press the incriminating “Pentagon Papers” during the Vietnam War, rightly compared Manning’s actions to his own. Their punishments, however, are very different. Ellsberg was charged in 1971 under the Espionage Act, but the case was dismissed in 1973 after evidence came to light of government misconduct, including illegal wiretapping. What a different era that was! As a hero to a strong antiwar movement, Ellsberg received much popular support. Moreover, now most government wiretapping is legal. We are just now learning from other “leakers” how extensive government surveillance of all of us has become post-9/11. Other Manning sympathizers in the U.S., scrambling for a shred of liberal respectability in which to clothe Manning’s actions, have claimed her conviction is a blow to “open government” and to freedom of the press–but comparison to private employee “whistleblowers” is absurd for soldiers, as is claiming a journalistic privilege. Whatever protections liberal democracy has provided in these areas throughout U.S. history has never been absolute, and has never applied to military personnel. While we don’t agree that the road to freedom lies in trying to reform this society, we appreciate her idealism and principles—and actions. We also believe in telling it like it is. “Leaking” is an act of rebellion; those who choose to do it are going to be prosecuted. We support them as best we can, but we do not expect to win a legal right to subvert governmental secrecy. For that, the rules of society will have to be changed by the working class through its own mass activity and engagement with new ideas.